Changes to the Green Certificate Program will allow more students to access the agriculture program. 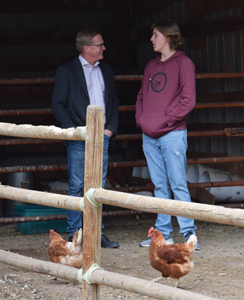 In an announcement at the Meyer’s farm in Coaldale, Education Minister David Eggen said that student looking to access the GCP will no longer have to worry about money being a barrier. “The Green Certificate Program is part of our high school program. It’s a way in which students can get credit for farming knowledge and farming learning in the school and outside the school as well. It’s that nice combination of classroom and industry and apprenticeship in a way,” said Eggen. The province will be providing $400,000 in funding to the program, to cover the course fees for the students. Currently, over 750 students participate in the program each year. Eggen assured that those looking to access the program now that the money barrier is gone will not be turned away, even if there’s “a big rush” of students now looking to access it. 16-year-old Ethan Meyer will be one of those students participating in the GCP. Meyer started up his egg business when he was 7 years old and looking to raise money to buy himself an iPad, and he kept Ethan’s Eggs running over the years. It takes him about one to two hours a day to take care of the eggs, and he sells about 90 dozen eggs a week. “(The GCP was) $1,000 or so before, and that’s coming out of my pocket. Now, I don’t have to pay that and there’s less stress, I guess, on getting the money to do this program in order to get the credits I need for school,” said Meyer, noting that between his business, school and sports, his days get quite busy. In addition to the elimination of the tuition for the GCP, poultry technician was added to the lists of program offered through the GCP as it expands. Running his egg business means that he can’t get a typical part time job, although Meyer says he prefers selling eggs. “It develops my already preexisting knowledge of poultry farming, stuff like that. Being able to take the program will further progress my knowledge in that area and, I guess, the business and marketing section of it too. Being able to do that, will overall help my business and all aspect of it,” said Meyer. After graduating high school, Meyer plans on going to university, hopefully on a golf scholarship, and study either medicine or computer science. He plans to keep his business going through high school, and advises aspiring young egg entrepreneurs to never give up. The GCP was created in 1975 by Alberta Agriculture and Forestry, in order to address labour market needs for the province’s agriculture sector. Each specialization offered by the program gives students access to the first level of an agricultural-like apprenticeships, and provides the opportunity for students to study agriculture-related, structured learning pathways as a part of their regular senior high school learning experience.